Half of all Americans believe the economy is in excellent or good shape, unchanged from the fourth quarter of 2018, but down from 58 percent in the third quarter, according to CNBC's All-America Economic Survey. Overall, 47 percent of the public approve of President Trump's economic stewardship, down a point from last quarter. Despite rising concerns about growth this year, the CNBC All-America Economic Survey finds confidence in the economy holding up, dropping from the optimistic heights of last year but maintaining relatively strong levels. The survey of 800 people across the country, with a margin of error of plus or minus 3.5 percentage points, shows half believe the economy is in excellent or good shape, unchanged from the fourth quarter of 2018 but down from 58 percent in the third quarter. The decline tracks the slowing of growth in the economy over the past year. Approval of President Donald Trump's handling of the economy also ticked down for the second straight quarter but remains positive. The poll was conducted March 18-21, before the summary of the Mueller report was made public. Overall, 47 percent approve of Trump's economic stewardship, down a point from last quarter, and 43 percent disapprove, up a point. The president's net positive on the economy of 4 percentage points represents a drop from his net positive of 15 points registered in June, when more than half of the public approved of his handling of the economy and when growth was around 4 percent, nearly double the current rate. Trump's overall approval remains negative with just 40 percent approving of the job he is doing as president and 49 percent disapproving. Both numbers are a bit worse than the fourth quarter data but less negative than the president's worst numbers registered in June 2017. Economic optimism also took a hit, with 31 percent saying the economy will get better in the next year, unchanged from last quarter but down again from 36 percent in the third quarter. 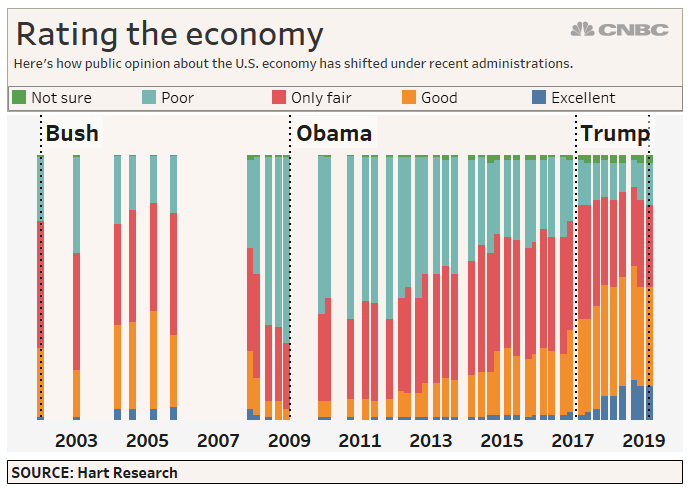 Despite the drop in views on the current and expected state of the economy, the levels remain high by historic standards and considerably above where they were before Trump took office. That is, there's been some decline, but much of the "Trump Bump" remains. "In terms of the state of economy, the percentage rating it excellent or good is at 50 percent — no different than a year ago but way different from when President Trump started," said Micah Roberts, the Republican pollster for the survey with Public Opinion Strategies. Jay Campbell of Hart Research Associates conducted the poll and served as the Democratic pollster. Both economics and politics are behind the bump. Under Trump, growth has been somewhat stronger and the unemployment rate, which fell sharply under President Barack Obama, has fallen further. Wage gains have accelerated in the past year as well. But the partisan divide is striking, too. Under Obama in October 2016, just 37 percent of Democrats and 11 percent of Republicans rated the economy as excellent or good. Today, 83 percent of Republicans say the economy is excellent or good versus 28 percent of Democrats. So Republicans under Trump are more than twice as positive on the economy as Democrats were under Obama. The outlook for gains in housing and wages tells a similar story. Forty percent look for their wages to rise in the next year, down 2 points from last year's high, but up 4 points from the four quarters before the election. Optimism in the stock market follows a path more linked to the market's performance than the economy. The percentage of Americans saying now is a good time to invest in stocks jumped 3 points to 41 percent from December, while the percentage saying it's a bad time to invest fell 6 points to 30 percent. But both remain worse than the October survey, taken when the market was near its all-time high. But in a potentially negative development for consumer spending, American views on the 2017 tax cut have not gotten better with time (as some tax experts and politicians predicted) and look to have grown a bit worse. Just 31 percent of Americans report they had more more take-home pay last year from the tax cuts, down from 34 percent in June. And just 21 percent say they have personally benefited from the tax measure while about two-thirds of Americans say large corporations and the wealthy have benefited.